Labcal Technologies will be incorporating UPEK’s TouchChip Fingerprint Sensor (on display at CTST) into its Be.U Mobile handheld reader, developed for use in employee ID verification, e-passports, and law enforcement. The reader can be used with existing AFIS systems and performs 1:1 matching with an ID document, contact or contactless and 1:N matching by storing the fingerprint templates and the credentials in the reader or on a server. BERKELEY, Calif.–UPEK, Inc., the leading brand of fingerprint authentication security solutions, announced that Labcal Technologies, Inc. is integrating UPEK’s TouchChip TCS1 Fingerprint Sensor on display at CTST in its Be.U Mobile SMC-800 ruggedized handheld reader for ID verification. Labcal’s Be.U Mobile has been developed to satisfy the current and future requirements for projects related to employee ID (transportation, TWIC, CAC), travel documents (e-Passports), and law enforcement. Labcal’s Be.U Mobile will be demoed at CardTechSecureTech in San Francisco on May 2-4 (Moscone Center, Labcal booth #429). Labcal continues to expand its line of authentication solutions with UPEK fingerprint sensors including the SmartPrint Mobile Checker handheld unit for ID card verification, the SmartPrint Desktop Enroller for issuing ID cards, Sentry SAC-2500 and Sentry SAC-3000 physical access control devices, and the TruBlue USB Fingerprint Reader for user identification and ID authentication. Labcal’s new Be.U Mobile rugged reader is algorithm agnostic and can be used with existing AFIS systems. The Be.U Mobile performs 1:1 matching with an ID document, contact or contactless and 1:N matching by storing the fingerprint templates and the credentials in the reader or on a server, and communicates wirelessly with a server via Wi-Fi, GSM or CDMA. UPEK, Inc., the global leader in biometric fingerprint security solutions, offers integrated end-to-end solutions including comprehensive design & integration services to the world’s leading consumer and industrial products companies. UPEK solutions enable the strongest fingerprint authentication security available, packaged for high user convenience and rapid integration into existing products and network architectures. 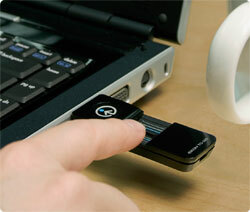 The company has been pioneering biometric fingerprint technology since 1996 and shipping product in volume since 1999. UPEK is headquartered near Berkeley, California, with offices in Prague, Singapore, Taipei and Tokyo. For more information, please visit www.upek.com. Founded in 1995, Labcal Technologies Inc. develops and markets authentication solutions based on biometric, smart card and PKI technologies. Labcal offers trusted and highly secure digital identity systems for a wide range of applications, such as: physical access control, logical access control, military ID and national ID cards. Labcal also provides the market with a complete integrated authentication solution that supports physical and logical access control as well as mobile authentication. Labcal offers a full range of core and vertical-market solutions for requirements in any of the following sectors: homeland security, airport, seaport, healthcare, civil ID, government, and Fortune 1000 Enterprises. For further information please visit www.labcal.com.